“I’ve put myself in the hedgehog’s skin. I was thinking about how I would feel if some giants were kicking me like a ball, while I was in pain.” – a young student from Split who helped a hedgehog that children abused. 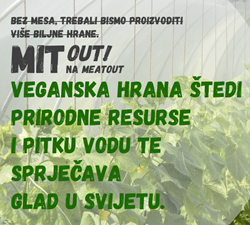 We celebrated Meatout day on March 20th by preparing 11 most common myths about meat and vegan diet. We shared them with media and on social networks and invited people to spend the day without meat, start a 30-day veggie challenge, or stop eating animals altogether. After a bear cub was found near a road without his mother, and placed in the ZOO for nursing, we sent a letter to the Ministry with a concern about the bear’s future. 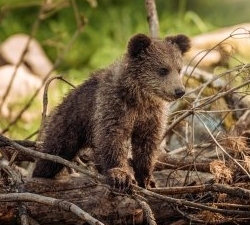 The bear who was named Matija gained a great sympathy from the public, which expects him to be returned back to nature when older, or if not possible, to a sanctuary. What we agree with is that nobody wants the bear to be left in the ZOO for his own good. 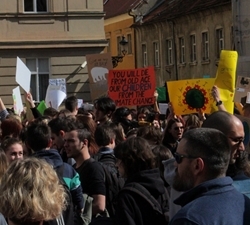 We supported the global student’s initiative, ‘School strike 4 climate’ in Zagreb, where students organized their first strike. The worldwide initiative was started by Greta Thunberg, who is vegan and wishes, amongst other things, to spread the awareness of the huge impact of animal agriculture on the climate. She started a strike, which grew into a movement where students in over 75 countries spent their Fridays on the street with banners. Look at the gallery from the first protest. We have warned the public about the devastating fact that more than 300 cities and municipalities still haven’t harmonized their local regulations with the Animal Protection Act. This is inconceivable, considering that prescribing mandatory sterilization of dogs and cats would result in huge savings in their budgets, as more than 150 municipalities have already realized. To mark Women’s Day, we pointed out the connection between the movements for women’s and animal rights. 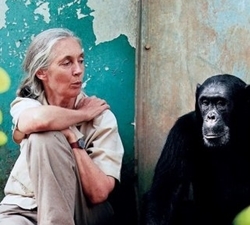 We named a few women that can be credited for changing the way animals are viewed as and treated, such as dr. Jane Goodall, Melanie Joy, Carol J. Adams, Aleksandra Hampamer, and others. Because of the fact that meat, dairy, and egg industries are based on the exploitation of the female reproductive system, and the relationship between a mother and a child, veganism and animal rights movement are an inevitable part of the women’s rights movement. British actor Dan Richardson released the trailer for his documentary “Food for Thought”, which was partly filmed in Croatia. 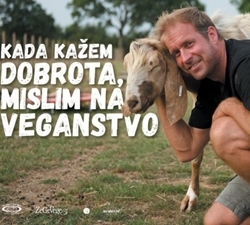 We are proud that the documentary shows scenes from last year’s ZeGeVege festival, Croatian Veganmania, which will take place in Zagreb, this year in September. 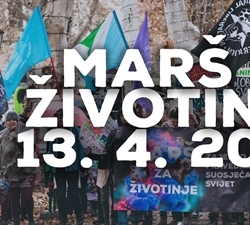 We are actively preparing for the upcoming March for the Animals 2019, which will be held on April 13th. We invite everyone who can show their support, and come if they can. We expect this March to be the biggest and loudest so far! We took part in numerous meetings with majors and chiefs of municipalities, on taking concrete steps towards reducing the number of stray dogs and cats in their areas. 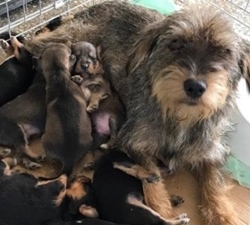 We filed a report against a few people who have been repeatedly using puppies to beg for money for years. The student’s initiative for introducing vegan meals to student cafeterias is still active. Our campaign for the ban of pyrotechnics is ongoing, you can sign the petition here.